Attic vents are one of the most common entry points that wildlife will use to gain access to a building. Vents are commonly covered with a thin screen meant only to keep out insects such as bees and wasps. These screens can become loose over time or wildlife such as squirrels or raccoons will tear through the screen with little resistance, rendering them useless. After gaining access to the attic, squirrels and raccoons will chew wiring which can create fire hazards as well as contaminating the insulation with droppings and urine. 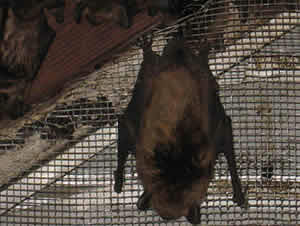 Bats commonly enter through louver vents because of the easy access into an attic. Bats will hang on the screen inside the attic because the air flow that moves through the vent cools their bodies. Once inside the attic, bats will deposit their droppings, or guano, on the attic floor and a health hazard can be created from exposure to the histoplasmosis fungus. The guano must be removed using protective equipment to avoid exposing humans to inhalation of the dust from the droppings, thereby, avoiding histoplasmosis infection of the lungs. Our specialists will evict whatever wildlife has invaded your attic, then waste products will be removed, the attic sanitized and new insulation installed, if needed. Installation of special screens and vent covers will prevent future animal infestations. No matter what your vent repair needs might be, we can provide a custom solution for any situation. Contact the Wildlife Control Professionals at A All Animal Control today to resolve your wildlife conflict and install custom attic vent screening.